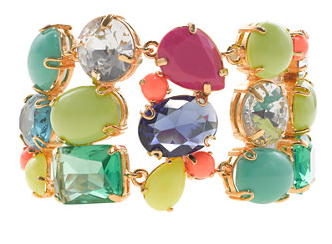 There is no shortage of J.Crew “inspired” jewelry on the interwebs these days…and I’m not just referring to the plethora of bubble necklaces you can find on eBay. 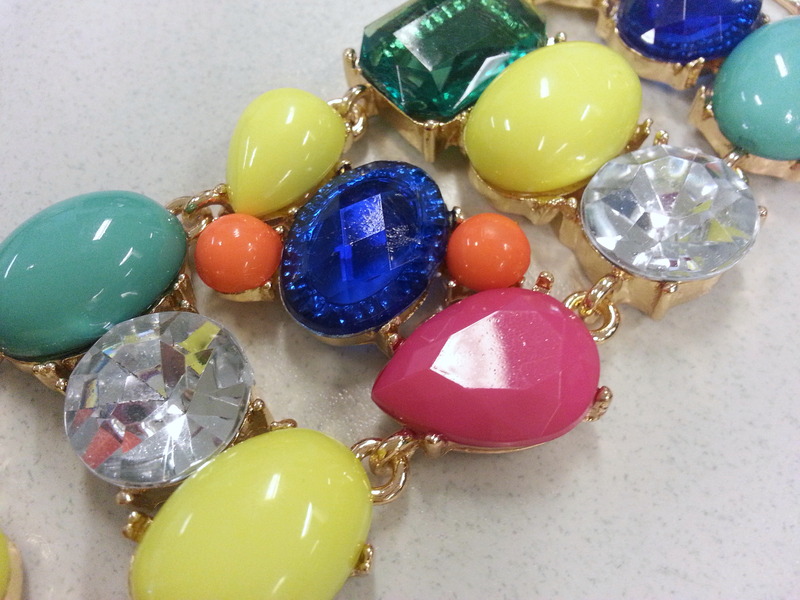 One site that I’ve ordered several pieces of jewelry from lately has been Groopdealz. It is my understanding for the most part that the site showcases independent vendors so they are reselling their items at a discount via the site. The sales usually last a few days and you can receive a daily email about the sales. 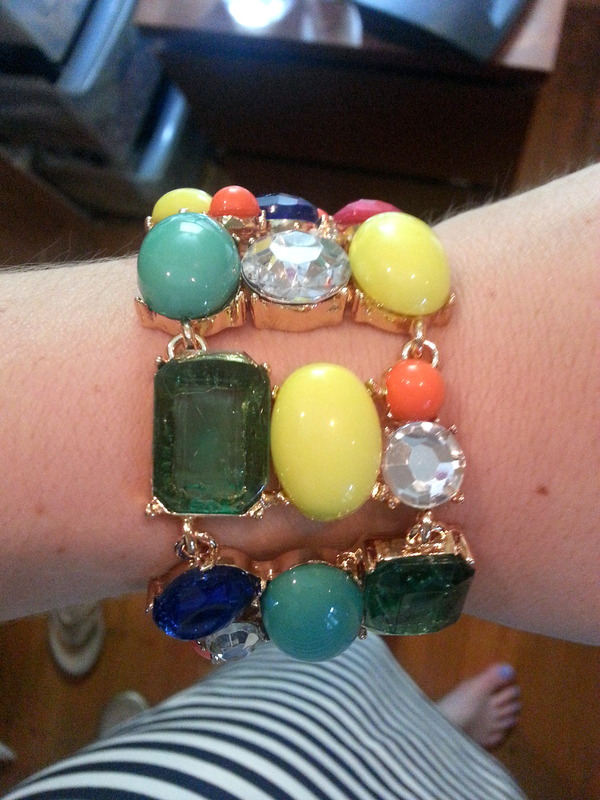 A few weeks ago, I saw versions of J.Crew’s color mix bracelet and necklace advertised for $10.99 and $19.99 respectively, so I jumped on it. I had admired both items on several bloggers (you can see the bracelet reviewed by Shopping with M here and Jcrewismyfavstore here) but after several instances of having the items in my cart, I never pulled the trigger. I knew I realistically wouldn’t wear the items enough to justify the cost. But…for $37 total with shipping, I could deal with that. 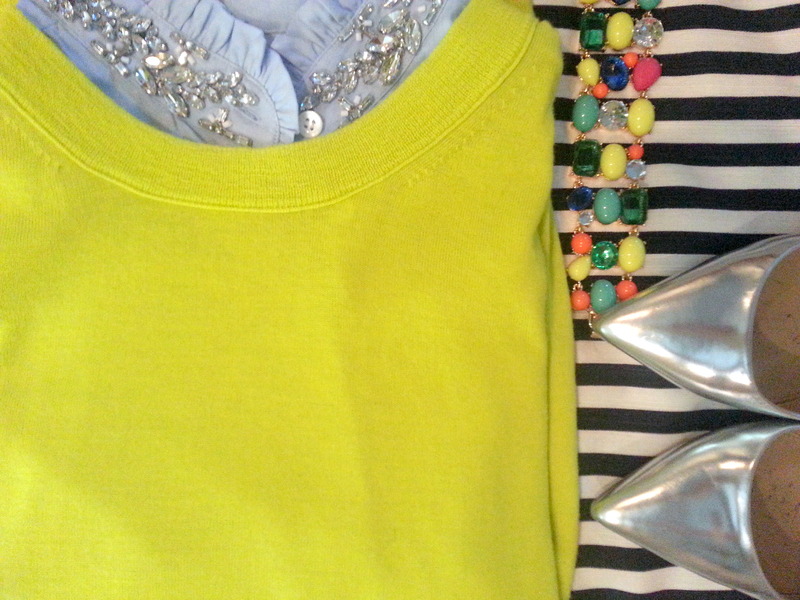 The bracelet took about two weeks to arrive (which when you’re used to 3-5 days for J.Crew it seems like a lifetime!) and I’m still waiting to get my necklace. I didn’t receive a shipment notification so I feel like it’s just the big wait and see as for when these items will arrive in the mail. From what I can tell, the stones are pretty spot on as far as shape and placement. Never having seen the retail versions in person, I can’t say how comparable the stones are but I’d like to hope the retail version are nicer. The matte color stones look fairly standard but the transluscent stones and the clear stones are the ones that look “cheap” to me up close. Overall, for $11, I can’t complain. The stones are clearly glued in to the settings, and based on the photos of the retail version, the retail version has prongs holding them in place. Knowing nothing about jewelry making and design, it seems like this is probably a significant cost cutting measure. So there are remnants of glue on the corners of some of the stones, which you can’t see from a distance but can see up close. The clasp is a little sticky and the bracelet was stiff when I received it, you need to work the hinges just right to get it to bend. A few stones were slightly scratched as well. But again, for $11, these are things I can overlook. I wore the bracelet today and received multiple compliments on it. Here’s a closeup of the stones, you can see some of the scratches and glue marks. So, what do you think? Do you have this bracelet or an “inspired” version of it? Would love to hear what you think and thanks for visiting! Your outfit was so cute. Take a teensy bit of wax paper to the clasp. Maybe it’ll slide smoothly after that. I see what you mean about the translucent stones. Excellent breakdown. For the price, I would overlook the qualms. I don’t expect to wear this stuff forever and some of it could probably get passed down similar to costume jewelry from previous eras, but I haven’t really been planning on that. Thanks for sharing! Thank you!! I’ll definitely try the wax paper. And I agree about the length of wear – I consider it to be fashion jewelry that will come and go…so for the price, I’m completely fine with what I will get out of it. I agree with you,that the clear stones look cheap and that the prongs look nicer(and are more secure) on the real bracelet. But for the price it is ok.I still havent gotten it(it goes to my US adress),but i am looking forward to it.